Presenting the "SI Ultimate Complex" - our 3-in-1 Complete Quantum Diagnostics and Energy Compensation Complex. We live in the New Age times when both the Medicine (holistic doctors) and the Science (quantum physics) recognize on a proved basis, that a Human Organism is a complex multi-level system that includes the physical processes, the mental processes and the energy-information processes. So very often, it's a connection between all 3 levels that creates health problems that aren't possible to tackle by only scanning the physical body. 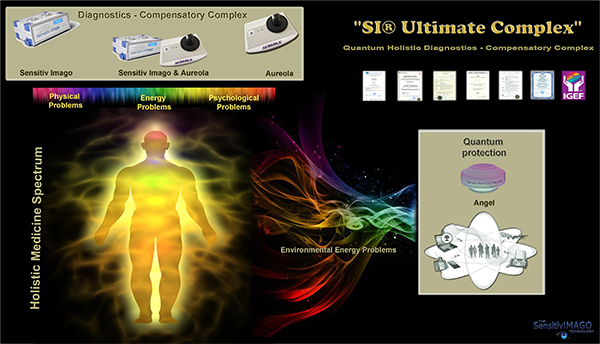 Introducing our "SI Ultimate Compex" which offers a unique combination of 3 Holistic Health technologies that, for both medical and alternative practitioners, open an unparalleled work with health on all the levels - physical problems, energy problems, psychological problems, electro-magnetic polution in modern homes and offices. Sensitiv Imago - our best-selling diagnostics/testing/compensation technology. Provides a full scan of human body, identification of pathogens and individual testing of food, medicines, supplement. Also includes the energy compensation possibilities for organs and systems. Aureola S - our new bio-photon holography scan technology. Provides the view of the energy-imbalancies in a) the Human Bio-field Energy (Aura) and b) the Human Energy Centers (Chakras) and their impact on the problems in the physiological organs of the tested person. Element 3: Problems with the environmental electro-magnetic polution. All-in-One System: full body scan, diagnostic analysis, testing of treatment products,energy compensation healing, energy preparations. Physical, energy and psychological problems: identify the initial source of the problem. All the components of “SI Ultimate Complex” have a valid European certification.